While several Massachusetts districts have moved their bell times in the past decade, the rate of change is picking up rapidly as educators, health professionals, parents, and students increasingly work together. Mary Hamaker, who leads the statewide chapter of the nonprofit Start School Later says she is is aware of 35 school districts at various stages of reviewing this issue and the logistics of changing schedules. Just last week the Easton school district voted to delay both its middle and high school bells by as much as 55 minutes next fall. Melrose, Canton, and Ashland also recently announced that they will push their high school start time to after 8:00 a.m. In an historic move, superintendents from an entire athletic conference, the Middlesex League, signed a joint statement committing to move their start times to between 8:00 and 8:30 a.m. by fall 2018. The Northborough/Southborough regional school district is working to get the 10 other districts in the Assabet Valley Collaborative to collaborate to move school start times. These districts are hoping they'll see the same immediate drops in failing grades and suspensions reported by Cape Cod's Nauset High School right after moving its bell times later in 2012. These findings were confirmed over time, with an additional benefit of a reduction in tardiness. Studies in other states have shown similar benefits again and again, finding that later school start times also often mean more sleep for more students, as well as less depression, caffeine use, substance abuse, and car crashes. The Massachusetts Association of School Committees (MASC) resolved in 2015 to support legislation calling for a special commission to study the appropriate starting time for students in middle and high school. MASC recently ran a panel discussion for school committee members regarding school start time issues. 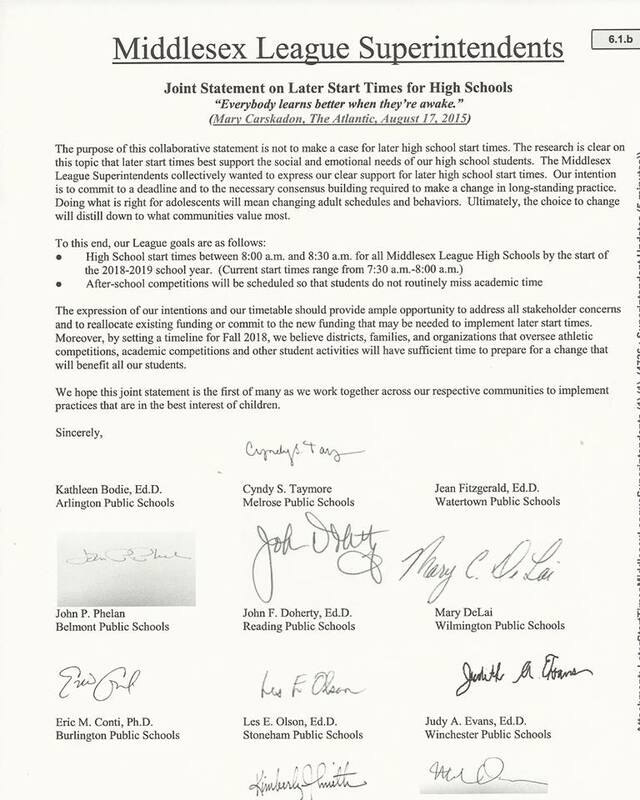 The Massachusetts Medical Society also recently resolved to support starting middle and high schools after 8:30 a.m., as did the Melrose Department of Health. Meanwhile, several prominent sleep experts at the Harvard Medical School, Harvard School of Public Health, and Boston Children's Hospital have been vocal about the need for sleep-friendly school hours, testifying at local school meetings and raising awareness via traditional and social media, panels, and community meetings. The number of local Start School Later chapters continues to expand as the discussion about school start time grows louder. Chapter leaders are starting those conversations in their communities and pushing for healthy start times. Three of these chapter leaders serve, or were recently elected to serve, on their local school committees (the term for school boards in Massachusetts). "The momentum is gaining considerable speed in Massachusetts," says Hamaker. "We have 14 town-based chapters where parents and school officials are cooperating to work through the logistics to change school start time. Their local efforts are becoming statewide efforts as more and more people contact Start School Later about how to drive the conversation in their towns." A bill is working its way through the Massachusetts Senate that would create a commission to study the logistical issues involved in changing school start time to help schools work toward healthy hours of operation. Sponsored by Senator Cynthia S. Creem, this bill would authorize a comprehensive study of the issue, including a review of the science about adolescent sleep and the impact of school start times on health and academic performance. It would also identify resources to help districts implement later middle and high school start times. A second, related bill, has already passed the state senate and is now awaiting approval in the House. This bill also includes a statewide study on the impact of school start time on student sleep. Let's hope the later school start time fire in Massachusetts keeps spreading around the nation. Our kids, and our communities, shouldn't have to wait any longer.